1. DiagnosTechs, Kent, WA, USA.2. Institute of HeartMath, Boulder Creek, CA, USA.3. Halberg Chronobiology Center, University of Minnesota, Minneapolis, MN, USA.4. National Institute of Child Health and Human Development, Bethesda, MD, USA. Circadian desynchronization of the adrenocortical cycle, seen in the laboratory (1), is here found in a case of half-yearly recurrent loss of vigor with a history of 20 years. 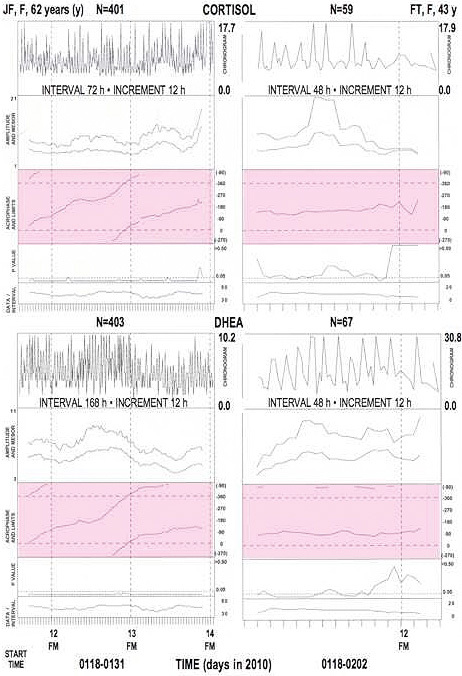 Figure 1 shows, on the left, with several resolutions, dependent on the differing intervals used for serial section analysis, that whether the interval is of one day, of one week or of intermediate length, there is a consistent delaying time course of acrophases, establishing beyond doubt, by a full scan of the 24-hour (h) period (f), that during the adynamic depressed span investigated, a non-24h societally desynchronized cycle characterizes cortisol and thus glucocorticoid function in JF, a 62-year-old magnetolabile woman. The fact that the CIs (95% confidence intervals in square brackets) of the circadian point estimate of f of 24.57h [24.44, 24.70] of ELISA-determined cortisol (in saliva collected at about 4h intervals around the clock for 41 days) and of DHEA f = 24.54h [24.46, 24.71] cover neither the 24.00h nor the 24.80h trial f, is in keeping with a similar finding on three variables gauging the circulation of JF during the span for which cortisol was assayed. Thus, in the winter episode neither the adrenal cortex nor the circulation were societally or lunarly synchronized. As to the possibility of internal desynchronization of cortisol vs. vigor, it seems pertinent that, although the CIs of the point estimates of the fs of these two variables overlap each other, the point estimate of vigor falls outside the CI of cortisol, a non-overlap. Systemic circadian desynchronization from both society and from the double tidal lunar periodicity is seen for all endocrine and vascular variables investigated thus far (in parts of cycles 11 and 12) during JF’s adynamic downtime, whereas by contrast there is overlap by the CI of wellness-vigor, 24.71h [24.10, 25.32], of the double tidal period, which happens to have a slightly different point estimate of the vigor f (of 24.71h rather than 24.84h during the particular 41 days for which cortisol determinations were then available). By contrast, as the right of Figure 1 shows, FT, JF’s daughter, is 24h synchronized, as documented by a more or less horizontal time course of acrophases. Adrenocortical resynchronization is also documented for the span beyond that in Figure 1 (not shown) for salivary cortisol and DHEA in JF with 574 determinations for each variable. A differently 24h desynchronized salivary cortisol vs. a 24.8h synchronized vigor, with acrophases scanning the 24h span with a slight difference in f during 41 days of an adynamic episode, could possibly result in a beat and thus a mechanism of behavioral disease, as postulated long ago (2; cf. 3). Halberg Franz, Cornélissen G, Katinas G, Syutkina EV, Sothern RB, Zaslavskaya R, Halberg Francine, Watanabe Y, Schwartzkopff O, Otsuka K, Tarquini R, Perfetto P, Siegelova J. Transdisciplinary unifying implications of circadian findings in the 1950s. J Circadian Rhythms 2003; 1: 2. 61 pp. http://www.jcircadianrhythms.com/content/pdf/1740-3391-2-3.pdf. Halberg F, Loewenson R, Winter R, Bearman J, Adkins GH. Physiologic circadian systems (differences in period of circadian rhythms or in their component frequencies; some methodologic implications to biology and medicine). Proc Minn Acad Sci 1960; 28, 53-75. 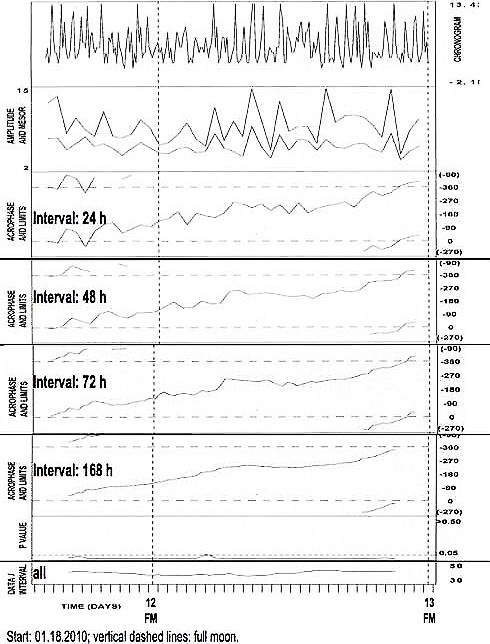 Cortisol desynchronized from the societal day in 4-hourly around-the-clock saliva (top row) of JF, F, 62 years of age, during a span of unwellness with loss of vigor; delaying acrophases seen in fit of a 24-hour cosine to data in ntervals of 24 (row 3), 48 (row 4), 72 (row 5) or 168 (row 2) hours, scan the 24-hour scale from shortly after midnight (=0*) to the next midnight (=360*). Societally desynchronized (left) or synchronized (right) salivary circadian rhythms in two magnetolabile women*. 24-hour (h) cosine curve fitted to data collected around the clock at about 4-h intervals. Analyses of data in specified interval pergressively displaced by 12-h increments. FM: full moon. Acrophase areas: shaded. Note obique delaying course (left) indicating period longer than 24 h.